He is a Japanese and a lawyer who grew up in Tokyo, Japan. He graduated from the Department of politics and economics at the Waseda University which is positioned as the first ranking in Japan. He was born in 1973. His occupations are a certified-by-government international lawyer (attorney at law) and a certified-by-government specialist about management of apartments . (5)"The Japan Business Law Examination" by Tokyo Chamber of Commerce and Industry ,which is an examination of the capability of the lawyers who are doing business of judicial affairs, he has the score of the 1st ranking in Japan in 3531 persons. (6)And also he has some language licenses, etc.. Totally, he has 15 licences. 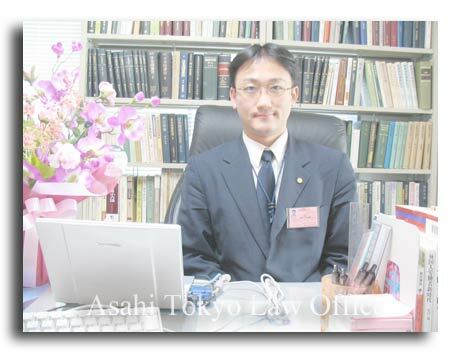 Furthermore, using such capability, he has experiences in which he educated students about law, such as students in the Department of Law at the University of Tokyo and the Keio University,etc.. Moreover, he has experiences in which he taught the employees of the judicial-affairs section of companies about the knowledge of judicial affairs. The fields which he is taking charge of in this office are the following (foreigners, employment, etc.). What Business is performed in this office? Consultant, about Judicial and legal affairs, centering on "EXAMPLES" on TopPage. Especially we deal with employment of a foreigner and the problems of families, such as an mixed marriage. Moreover, we also support a foreign company when it carries out business in Japan (finding a business partner in Japan , etc.). We are looking for specialists, SOHO, the investors, etc., in order to carry out business tie-up and management of our office.